Retinal detachment (see the image below) refers to separation of the inner layers of the retina from the underlying retinal pigment epithelium (RPE, choroid). Next to central retinal artery occlusion, chemical burns to the eye, and endophthalmitis, it is one of the most time-critical eye emergencies encountered in the emergency setting. 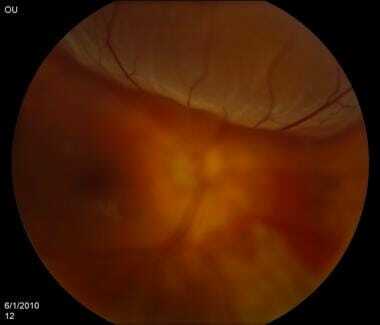 Retinal detachment. Courtesy of Kresge Eye Institute, Detroit, Michigan. Laboratory tests are not helpful in detecting retinal detachment, but basic blood work may be useful if the patient requires surgical intervention. Unless globe rupture, orbital/facial bone fractures, or intraocular foreign bodies are suspected, diagnostic imaging is not warranted. See Overview and Workup for more detail. Retinal detachment repair is usually done on an outpatient basis. 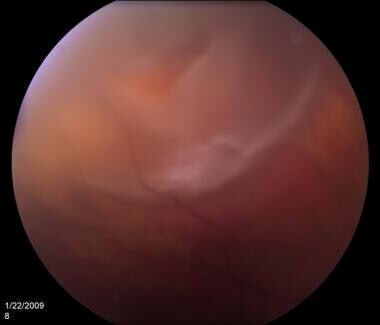 Next to central retinal artery occlusion, chemical burns to the eye, and endophthalmitis, a retinal detachment is one of the most time-critical eye emergencies encountered in the ED. Retinal detachment (RD) was first recognized in the early 1700s by de Saint-Yves, but clinical diagnosis remained elusive until Helmholtz invented the ophthalmoscope in 1851. Tragically, retinal detachments were uniformly blinding until the 1920s when Jules Gonin, MD, pioneered the first repair of retinal detachments in Lausanne, Switzerland. 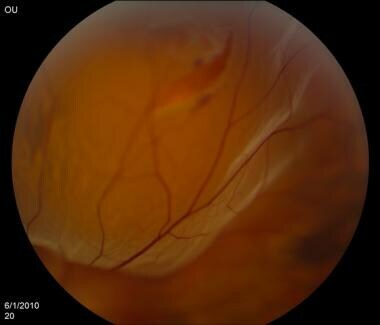 Today, with the advent of scleral buckling and small-gauge pars plana vitrectomy, in addition to laser and cryotherapy techniques, rapid ED diagnosis and treatment of a retinal detachment truly can be a vision-saving opportunity. 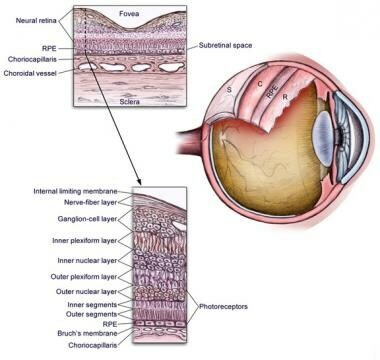 Eye anatomy is shown in the image below. Retinal detachments may be associated with congenital malformations, metabolic disorders, trauma (including previous ocular surgery),  vascular disease, choroidal tumors, high myopia or vitreous disease, or degeneration. Exudative or serous detachments occur when subretinal fluid accumulates and causes detachment without any corresponding break in the retina. The etiologic factors are often tumor growth or inflammation. 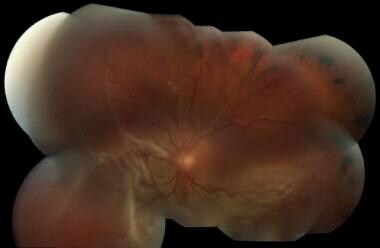 These types of retinal detachment do not usually require surgical intervention. Correction of the underlying disorder typically leads to resolution of these detachments. Tractional retinal detachment occurs as a result of adhesions between the vitreous gel/fibrovascular proliferation and the retina. Mechanical forces cause the separation of the retina from the RPE without a retinal break. Advanced adhesion may result in the eventual development of a tear or break. 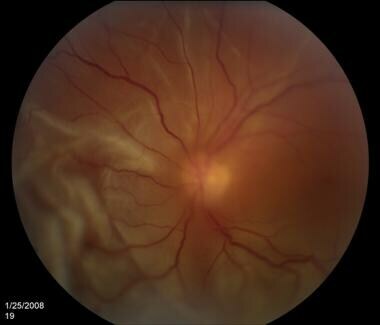 The most common causes of tractional retinal detachment are proliferative diabetic retinopathy, sickle cell disease, advanced retinopathy of prematurity, and penetrating trauma. 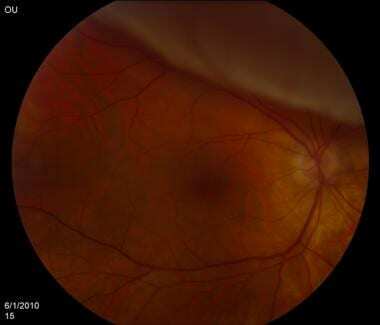 Retinal detachments are shown in the images below. Certain groups have higher prevalence than others. Patients with high myopia (>6 diopters) and individuals with aphakia (ie, cataract removal without lens implant) have a higher risk. Cataract extraction complicated by vitreous loss during surgery can have an increased detachment rate of up to 10%. The most common worldwide etiologic factors associated with retinal detachment are myopia (ie, nearsightedness), aphakia, pseudophakia (ie, cataract removal with lens implant), and trauma. Approximately 40-50% of all patients with detachments have myopia, 30-40% have undergone cataract removal, and 10-20% have encountered direct ocular trauma. Traumatic detachments are more common in young persons, and myopic detachment occurs most commonly in persons aged 25-45 years. Although no studies are available to estimate incidence of retinal detachment related to contact sports, specific sports (eg, boxing) have an increased risk of retinal detachment. Estimates reveal that 15% of people with retinal detachments in one eye develop detachment in the other eye. Risk of bilateral detachment is increased (25-30%) in patients who have had bilateral cataract extraction. There exists no racial predilection for retinal detachment incidence. There exists no gender predilection for retinal detachment incidence. As the population ages, retinal detachments (RDs) are becoming more common. Retinal detachment usually occurs in persons aged 40-70 years. However, paintball injuries in young children and teens are becoming increasingly common causes of eye injuries, including traumatic retinal detachments. As the retina is neuro-sensitive tissue, visual prognosis can be difficult to predict. Generally, a retinal detachment without macular involvement tends to have a better final visual prognosis. Mattioli S, Curti S, De Fazio R, Mt Cooke R, Zanardi F, Bonfiglioli R, et al. Occupational lifting tasks and retinal detachment in non-myopics and myopics: extended analysis of a case-control study. Saf Health Work. 2012 Mar. 3(1):52-7. [Medline]. [Full Text]. Subramanian ML, Topping TM. Controversies in the management of primary retinal detachments. Int Ophthalmol Clin. 2004 Fall. 44(4):103-14. [Medline]. Bjerrum SS, Mikkelsen KL, La Cour M. Risk of Pseudophakic Retinal Detachment in 202?226 Patients Using the Fellow Nonoperated Eye as Reference. Ophthalmology. 2013 Sep 8. [Medline]. McNamara D. Cataract surgery may up retinal detachment risk 4-fold. Medscape Medical News. September 13, 2013. Available at http://www.medscape.com/viewarticle/811031. Accessed: September 24, 2013. Lin H, Lema GM, Yoganathan P. PROGNOSTIC INDICATORS OF VISUAL ACUITY AFTER OPEN GLOBE INJURY AND RETINAL DETACHMENT REPAIR. Retina. 2015 Oct 14. [Medline]. Sonogram of retinal detachment. Courtesy of Bruce Lo, MD.